Technology plays a huge role in our daily lives, from the simplest of apps to the most groundbreaking inventions. Every website or piece of software that we encounter has been built by a web developer — but what exactly is web development, and what does a web developer do? To the outside eye, it can seem like a complicated, confusing and somewhat inaccessible field. So, to shed some light on this fascinating industry, we’ve put together the ultimate introduction to web development and what it takes to become a fully-fledged web developer. In this guide, we’ll go through the basics of web development in detail, and show you the most essential skills and tools you’ll need to break into the industry. Let’s get some background first, though — we need to learn to walk before we can run. If you’re already familiar with the basics of web development and its history, just click the anchor link to skip straight to a later section. 3. 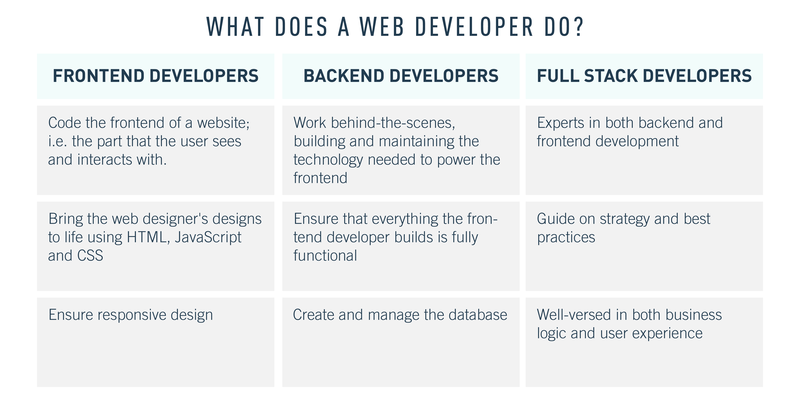 What Does a Web Developer Do? 5. What Does it Take to Become a Web Developer? Web development is the process of building websites and applications for the internet, or for a private network known as an intranet. Web development is not concerned with the design of a website; rather, it’s all about the coding and programming that powers the website’s functionality. From the most simple, static web pages to social media platforms and apps, from ecommerce websites to content management systems (CMS); all the tools we use via the internet on a daily basis have been built by web developers. Web development can be broken down into three layers: client-side coding (frontend), server-side coding (backend) and database technology. Let’s take a look at each of these layers in more detail. Client-side scripting, or frontend development, refers to everything that the end user experiences directly. Client-side code executes in a web browser and directly relates to what people see when they visit a website. Things like layout, fonts, colours, menus and contact forms are all driven by the frontend. Server-side scripting, or backend development, is all about what goes on behind the scenes. The backend is essentially the part of a website that the user doesn’t actually see. It is responsible for storing and organizing data, and ensuring that everything on the client-side runs smoothly. It does this by communicating with the frontend. Whenever something happens on the client-side — say, a user fills out a form — the browser sends a request to the server-side. The server-side “responds” with relevant information in the form of frontend code that the browser can then interpret and display. Learn more: What's the difference between frontend and backend? Websites also rely on database technology. The database contains all the files and content that are necessary for a website to function, storing it in such a way that makes it easy to retrieve, organize, edit and save. The database runs on a server, and most websites typically use some form of relational database management system (RDBMS). To summarize: the frontend, backend and database technology all work together to build and run a fully functional website or application, and these three layers form the foundation of web development. You might hear the terms web development and web design used interchangeably, but these are two very different things. Imagine a web designer and web developer working together to build a car: the developer would take care of all the functional components, like the engine, the wheels and the gears, while the designer would be responsible for both the visual aspects — how the car looks, the layout of the dashboard, the design of the seats — and for the user experience provided by the car, so whether or not it’s a smooth drive. Web designers design how the website looks and feels. They model the layout of the website, making sure it’s logical, user-friendly and pleasant to use. They consider all the different visual elements: what colour schemes and fonts will be used? What buttons, drop-down menus and scrollbars should be included, and where? What interactive touchpoints does the user interact with to get from point A to B? Web design also considers the information architecture of the website, establishing what content will be included and where it should be placed. Web design is an extremely broad field, and will often be broken down into more specific roles such as User Experience Design, User Interface Design and Information Architecture. In short, a web designer is the architect, while the web developer is the builder or engineer. The web as we know it today has been decades in the making. To help understand how web development works, let’s go back to where it all started and consider how the internet has evolved over the years. The internet is essentially a network of networks, connecting all different WANs. WAN stands for Wide Area Network, a telecommunications network that spans a large geographical distance. The first WAN was established in 1965 at the Massachusetts Institute of Technology. Later on, this WAN would be known as ARPANET. It was initially funded by the Advanced Research Projects Agency of the US Department of Defense. In October 1969, UCLA student Charley Kline sent the first ever internet message. He tried to send the word “login” to a computer at the Stanford Research Institute via the ARPANET network, but the system crashed after the first two letters. However, about an hour later, the system recovered and the full text was successfully delivered. The early 70s saw the development of several experimental LAN technologies. LAN stands for Local Area Network, a computer network that connects nearby devices in the same buildings — such as in schools, universities, and libraries. Some notable milestones include the development of Ethernet at Xerox Parc from 1973-1974, and the development of ARCNET in 1976. In 1982, Transmission Control Protocol (TCP) and Internet Protocol (IP) emerged as the ARPANET protocol, and TCP/IP remains the standard internet protocol today. In 1983, the Domain Name System was established, providing a more user-friendly way of labelling and designating websites (i.e. careerfoundry.com instead of a series of numbers). 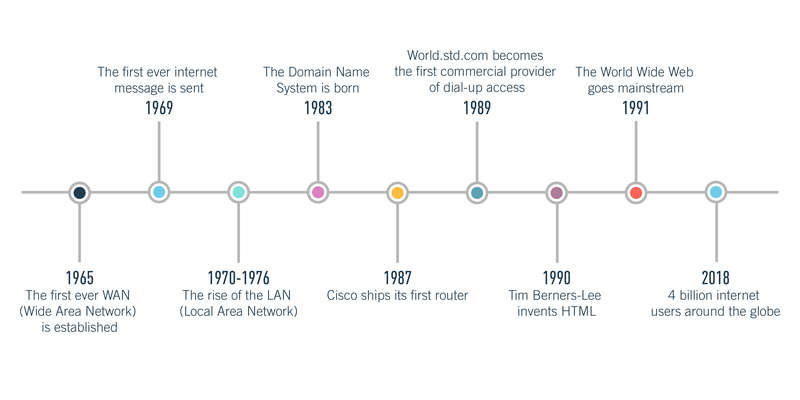 In 1987, Cisco shipped its first router, and in 1989, World.std.com became the first commercial provider of dial-up internet access. In 1990, Tim Berners-Lee, a scientist at CERN (the European Organization for Nuclear Research) developed HTML — HyperText Markup Language. HTML became, and still is, a fundamental building block of the internet. With the rise of the visual internet browser, the World Wide Web made its way into the mainstream. As of 2018, there are more than 4 billion internet users around the globe. The role of the web developer is to build and maintain websites. Web developers can work in-house or freelance, and the specific tasks and responsibilities involved will vary depending on whether they’re working as a frontend, backend or full stack developer. Full stack developers specialize in both the frontend and backend; we’ll go into more detail about what a full stack developer does later on. Web developers are responsible for building a product that meets both the client’s needs and those of the customer or end user. Web developers collaborate with stakeholders, clients and designers in order to understand the vision: how should the final website look and function? A large part of web development also revolves around identifying and fixing bugs in order to constantly optimize and improve a website or system. Web developers are therefore keen problem solvers, regularly coming up with solutions and workarounds to keep things running smoothly. Of course, all web developers are proficient in certain programming languages. However, different developers will work with different languages depending on their specific job title and area of expertise. Let’s take a look at the different layers of web development and the associated tasks in more detail. Learn more: What is a typical day in the life of a web developer? What does a frontend developer do? The frontend developer implements the website’s layout, interactive and navigational elements such as buttons and scrollbars, images, content and internal links (links that navigate from one page to another within the same website). Frontend developers are also responsible for ensuring optimal display across different browsers and devices. They will code the website in such a way that makes it responsive or adaptive to various screen sizes, so that the user gets the same experience whether they’re visiting the website on mobile, desktop or tablet. Frontend developers will also carry out usability tests and fix any bugs that arise. At the same time, they will consider SEO best practices, maintain software workflow management, and develop tools that enhance how the user interacts with a website in any browser. The backend is essentially the brains behind the face (the frontend). A backend developer is therefore responsible for building and maintaining the technology needed to power the frontend, consisting of three parts: a server, an application and a database. The code that backend developers create ensures that everything the frontend developer builds is fully functional, and it is the backend developer’s job to make sure that the server, application and database all communicate with each other. So how do they do this? First, they use server-side languages such as PHP, Ruby, Python and Java to build the application. Then they use tools like MySQL, Oracle and SQL Server to find, save or edit data and deliver it back to the user in frontend code. Just like frontend developers, backend developers will liaise with the client or business owner in order to understand their needs and requirements. They will then deliver these in a number of ways depending on the specifics of the project. Typical backend development tasks include creating, integrating and managing the database, building server-side software using backend frameworks, developing and deploying content management systems (for a blog, for example), as well as working with web server technologies, API integration and operating systems. Backend developers are also responsible for testing and debugging any backend elements of a system or application. A full stack developer is someone who understands, and can work across, the “full stack” of technology: i.e. both the frontend and the backend. Full stack developers are experts in every stage of the web development process, meaning they are well-equipped to get hands on, but can also guide on strategy and best practices. Most full stack developers have gathered many years of experience in a variety of different roles, giving them a solid grounding across the entire web development spectrum. Full stack developers are proficient in both frontend and backend languages and frameworks, as well as in server, network and hosting environments. They are also well-versed in both business logic and user experience. Web developers may also specialize in mobile app development, either for iOS or Android. iOS developers build apps that run with the iOS operating system — the one used by Apple devices. iOS developers are fluent in Swift, the programming language that Apple created specifically for their apps. Android developers build apps that are compatible with all Android devices, such as Samsung smartphones. Java is the official programming language for Android. In order to build websites and apps, web developers work with languages, libraries and frameworks. Let’s take a look at each of these in detail, as well as some other tools that web developers use in their day-to-day work. In the world of web development, languages are the building blocks that programmers use to create websites, apps and software. There are all different types of languages, including programming languages, markup languages, style sheet languages and database languages. A programming language is essentially a set of instructions and commands which tell the computer to produce a certain output. Programmers use so-called “high-level” programming languages to write source code. High-level languages use logical words and symbols, making them easy for humans to read and understand. High-level languages can be classified as either compiled or interpreted languages. C++ and Java, for instance, are compiled high-level languages; they are first saved in a text-based format that is comprehensible for human programmers but not for computers. In order for the computer to run the source code, it needs to be converted to a low-level language; i.e. machine code. Compiled languages tend to be used to create software applications. Interpreted languages like Perl and PHP do not need to be compiled. Instead, source code written in these languages can be run through an interpreter — a program that reads and executes code. Interpreted languages are generally used for running scripts, such as those used to generate content for dynamic websites. Low-level languages are those that can be directly recognized by and executed on the computer hardware; they don’t need to be interpreted or translated. Machine language and assembly language are some common examples of low-level languages. Markup languages are used to specify the formatting of a text file. In other words, a markup language tells the software that displays the text how the text should be formatted. Markup languages are completely legible to the human eye — they contain standard words — but the markup tags are not visible in the final output. XML stands for eXtensible Markup Language. It is a markup language very similar to HTML; however, while HTML was designed to display data with a focus on how it looks, XML was designed purely to store and transport data. Unlike HTML, XML tags are not predefined; rather, they are created by the author of the document. The point of XML is to simplify data sharing and transport, platform changes and data availability, as it provides a software and hardware-independent means of storing, transporting and sharing data. You can learn more about XML and how it works here. A style sheet is basically a set of stylistic rules. Style sheet languages are used, quite literally, to style documents that are written in markup languages. Consider a document written in HTML and styled using CSS (Cascading Style Sheets), a style sheet language. The HTML is responsible for the content and structure of the web page, while CSS determines how this content should be presented visually. CSS can be used to add colours, change fonts, insert backgrounds and borders, as well as to style forms. CSS is also used to optimize web pages for responsive design, ensuring they adapt their layout to whatever device the user is on. Learn more: What is CSS? Languages are not only used for building websites, software and apps; they are also used to create and manage databases. Databases are used to store huge volumes of data. The Spotify music app, for example, uses databases to store music files, as well as data about the user’s listening preferences. Likewise, social media apps like Instagram use databases to store user profile information; every time a user updates their profile in some way, the app’s database will also update. Databases are not designed to understand the same languages that apps are programmed in, so it’s essential to have a language that they do understand — like SQL, the standard language for accessing and manipulating relational databases. SQL stands for Structured Query Language. It has its own markup, and basically enables programmers to work with the data held in a database system. What are libraries and frameworks? Web developers also work with libraries and frameworks. Despite much confusion, they are not the same thing — although they are both there to make the developer’s job easier. Libraries and frameworks are essentially sets of prewritten code, but libraries are smaller and tend to be used for more specific use-cases. A library contains a collection of useful code, grouped together to be reused later. The purpose of a library is to enable developers to reach the same end goal while writing less code to get there. A framework contains ready-made components and tools that enable the developer to write code faster, and many frameworks also contain libraries. It gives the developer a structure to work from, and the framework you choose to work with will largely dictate the way you build your website or app, so choosing a framework is a big decision. Some popular frameworks include Bootstrap, Rails and Angular. The easiest way to understand libraries and frameworks is to imagine you are building a house. The framework provides the foundation and the structure, as well as instructions or guidelines for completing certain tasks. Say you want to install an oven in your new home: you could buy the separate components and build the oven from scratch, or you could pick a ready-made oven from the store. Just like building a website, you can write the code from scratch or you can take pre-written code from a library and simply insert it. Learn more: Should I learn Ruby on Rails? Web developers will also use a text editor, such as Atom, Sublime or Visual Studio Code, to write their code; a web browser, such as Chrome or Firefox; and an extremely crucial tool: Git! Git is a version control system where developers can store and manage their code. As a web developer, it’s inevitable that you’ll make constant changes to your code, so a tool like Git that enables you to track these changes and reverse them if necessary is extremely valuable. Git also makes it easier to work with other teams and to manage multiple projects at once. Git has become such a staple in the world of web development that it’s now considered really bad practice not to use it. Another extremely popular tool is GitHub, a cloud interface for Git. GitHub offers all the version control functionality of Git, but also comes with its own features such as bug tracking, task management and project wikis. GitHub not only hosts repositories; it also provides developers with a comprehensive toolset, making it easier to follow best practices for coding. It is considered the place to be for open-source projects, and also provides a platform for web developers to showcase their skills. You can learn more about the importance of GitHub here. A career in web development is challenging, financially rewarding, and has a lot to offer in terms of job security. 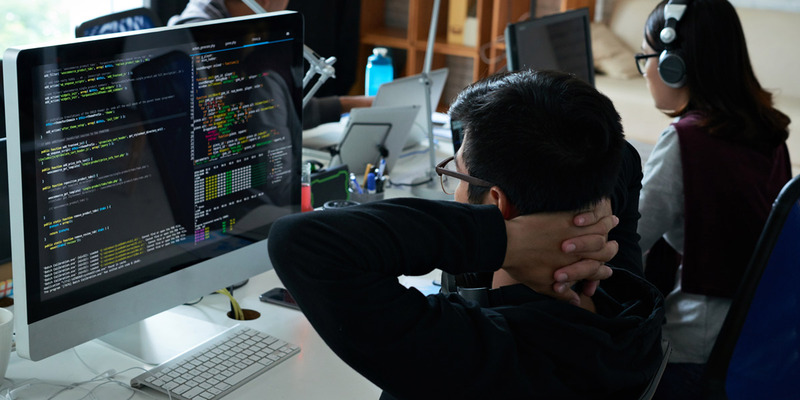 The Bureau of Labor Statistics predicts 15% employment growth for web developers between 2016 and 2026 — much faster than average — and web developer ranked as the 8th best job title in tech based on salary and employment rates. At the time of writing, the average salary for a web developer in the United States is $71,830 per year. Of course, salary varies depending on location, years of experience and the specific skills you bring to the table; find out more about how much you could earn as a web developer here. The first step to a career in web development is to learn the necessary languages, libraries and frameworks. You’ll also need to familiarize yourself with some of the above-mentioned tools, as well as some common terminology. For a beginner-friendly introduction, start with these 50 web development buzzwords that all new programmers should learn. Learn more: What skills and qualifications do you need to become a web developer?